It was time for me to redesign it to improve it, now it’s really easier to use, easier for me to maintain with about -10,000 lines of code. Most of the settings now are in the menu for faster access and less searching for them. [font=Times New Roman]Skyrim Script Editor is a tool to replace the Creation Kit’s default script editor. 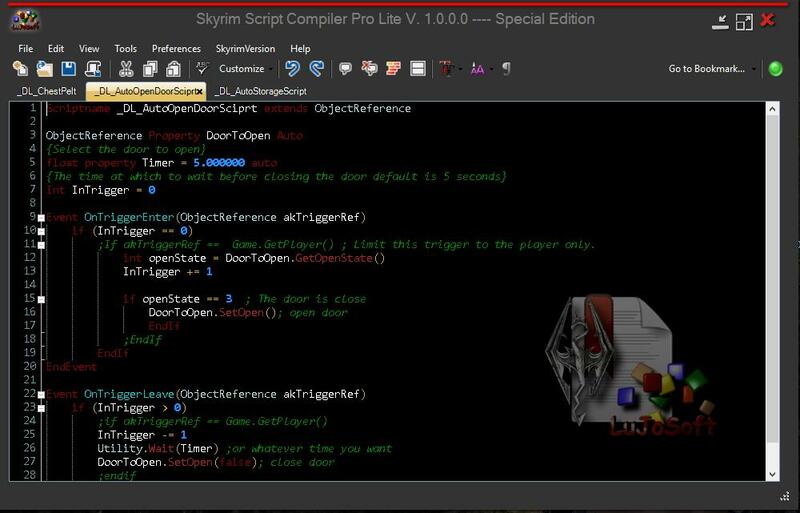 It provides the same functionality as Skyrim Script Editor Pro, with less bla bla in it and my way of giving back to the wonderful modding community. This is a tool strictly for Skyrim modders, not mod users. If you don’t understand it or the code being used, then this tool is not for you. It is used for the practice of[/font] Skyrim scripting. [font=Times New Roman]It’s currently very finish and functional, You can use it for all your scripting needs. I’ve implemented the features I most wanted to at the beginning of this project. However, I’m constantly looking for new suggestions to make this utility better, so please comment if you have any ideas. And, of course, I’ll continue squashing any bugs I find. If you find anything that may be a bug, please report it as well so I can get to it as soon as possible. If your able to run Skyrim then there shouldn’t be any problems with your OS. The installer that will install all the prerequisite needed. Note to EveryoneMy credentials as a software developer are known as LuJoSoft[/url], for many years now I’ve created over 70 freewares with more to come. not a virus, adware, etc. I hope you enjoy this tool and that I get as much feedback as possible, good or not (I mean it! I really would like feedback), because it’s the only way to create the best app possible. [/font]Credits to:Thank you Matthiaswagg for helping on the description.